The Milk was released by Born Crucial in mid-2007. Made of machined delrin, it featured a creative response system, which used lightweight spacers similar to Buzz-On's SPR system, with deep silicone grooves. Under the spacers were a set of rubber o-rings, which served to dampen vibration. 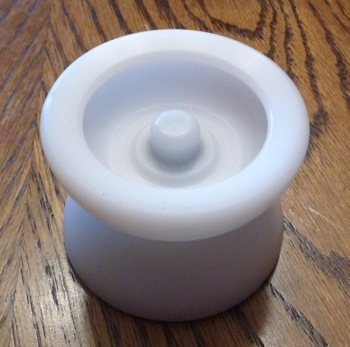 The result was an immensely stable and popular plastic yo-yo. Later, a second run (including a black version, as well as several very limited vibrant colors), and a small-bearing run called the '2%' were released.